Here’s a brief rundown of the likely top market movers for the week ahead. For further guidance on navigating and understanding the market week ahead see also our recent post on last week’s lessons for this week, part 1 and part 2. As we covered in our review of last week’s lessons for this week (referenced above), headlines and speculation about stimulus remain key. The big change last week was that we got news from both China and the US that the time for tightening approaches. Many of the likely top market movers are connected to variations on that theme. Whether or not any of them prove influential, will depend on how much of surprise they provide. For example, last week’s FOMC minutes (usually not a big market driver) were arguably among the very top market movers last week because for the first time in recent memory we saw serious hints that the Fed may be ready to start easing back on all the monetary easing. Given Congress’s recent pattern of last minute deals, markets remain calm despite the approaching threat of about 800k government workers suddenly without a paycheck. If anything convinces markets that a deal really might not happen, this other US-stimulus related story becomes very significant very quickly. Still, this is the least likely member of our list to really matter. After last week’s surprisingly hawkish FOMC minutes, one of the biggest questions this week for US, and thus global markets, will be how much clarification we can get on the Fed’s timing for cutting back on QE 3, which until recently had no end in sight. As mentioned in our discussion of last week’s lessons, if Bernanke confirms that the Fed really is getting more hawkish, he could literally reverse many major market trends, like the uptrend in global stocks and downtrend in the USD (and thus influence most other major currency trends). We remain skeptical for reasons discussed in our articles on last week’s lessons for this week here and here. Japanese and related stocks have been moving higher over the past months based on little besides the prospects of a weaker Yen, and that Yen has been falling based on anticipated Japanese policy changes. That anticipation gets put to the test this week when PM Abe names his new BoJ governor. Whether or not the uptrend in those stocks and downtrend in the JPY continue will depend on whether or not markets believe the new governor has the will and ability to live up to expectations for a continuously shrinking JPY. Of course, Japan’s ability to drive the JPY lower (and keep its stocks moving higher) will depend greatly on continued calm on long dormant but (as last week’s data showed) very much alive EU crisis. Reminder: Despite last week’s latest signs of deterioration in the EU, markets continue to believe there is no huge solvency question and EU crisis coming. An exceptionally strong showing by former PM Berlusconi or other outsider beyond the market-friendly center-left coalition could change all of that. Markets have mostly ignored Italy’s ongoing economic mess only because Greece and Spain appear to be even bigger insolvency threats. If Italy elects a coalition that doesn’t appear willing and able to continue PM Mont’s path to reform (at least as markets see it), that would be decidedly bearish for all kinds of inter-related reasons. For example, a sudden spike in EU anxiety would send bond yields higher for all of the GIIPS, including Spain. Speaking of Spain, news on the ongoing political scandal there suddenly went very quiet. We don’t believe that’s because it was all a harmless misunderstanding and all is right. We don’t know when we’ll hear more, or how. So watch not only headlines, but unexplained moves in Spain’s bond yields. It they start to jump, expect headlines to follow. In addition to those mentioned above, here are the prime scheduled events to watch. US: CB consumer confidence, new home sales. The big event of the day though, is Bernanke’s testimony, Tuesday and Wednesday, as noted above. Note: this is one of the rare cases in which the first Friday of the month doesn’t feature US monthly jobs reports, nor does the week include all of the reports that typically come before it that hint at the results for the monthly official BLS reports. The only such preliminary indication of the jobs report will come from jobs section of the ISM mfg report Friday. If Bernanke’s testimony has still left doubts about the whether the Fed intends to cut back on QE 3, this report could take on added significance as the most recent data that could influence the Fed. Over the past few weeks multi-year, or multi- decade (for the S&P 500) resistance has won out. That technical struggle will continue to influence how markets respond to the above and other events. Forex markets might not move other markets, but they could provide some advance warning about where the other markets are heading. As we noted in our post on last week’s lessons for the coming week, currency pairs that have normally followed stocks higher have been either flat or falling, particularly the EURUSD (despite the surface calm about the EU). Forex markets typically lead stocks and other asset markets, so keep an eye on this and other USD pairs. Without getting too technical, in recent years the big reason the USD rises is either a sudden spike in fear, or, on rare occasions, a sudden belief that USD rates might rise sooner than expected. Both of these factors could come into play this week. Much depends on how the results from both EU events (which could supply the fear) and from Bernanke’s testimony. We can’t stop the central banks from debasing the USD, EUR, JPY, and others, but we don’t have to accept their watered down fare either. If most of your assets are based in one of these, or others under similar threat of devaluation, you don’t have to let these dubious financial chefs continue to serve us horsemeat and call it beef. We can move into assets that are in currencies run by responsible adults. 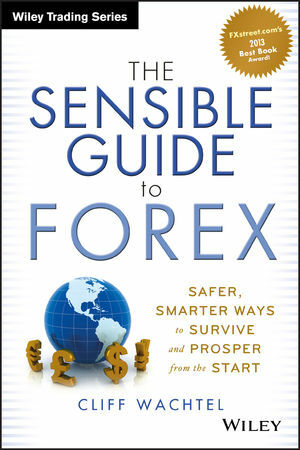 I’ve been saying for a long time that everyone needs to know about currency markets, and that my recently published book, The Sensible Guide to Forex, was your best guide regardless of whether you’re an aspiring trader, or passive investor who just wants some diversification out of the USD, JPY, EUR or other currency under devaluation threat. Now you no longer need take my word for it, as it just won Best Forex Book for 2013 by both popular vote and expert panel selection by forex professionals. See here for details.